A while back I ordered 2GB worth of RAM from Crucial. I have been anxiously waiting and waiting to install it since I upgraded to Vista. Originally I was not even going to upgrade to Vista until the RAM upgrade, but I was suddenly struck with the urge to upgrade and did an awful job at resisting. I have been waiting to upgrade my RAM primarily because of my BestBuy extended warranty. I was afraid that if I upgraded my RAM it would void my warranty. My Toshiba manufacturer warranty is almost up and I really don't care about that now. I am just afraid in a year my tablet screen is going to wear out and break in some manner. Tablet screens (especially the convertibles) are notorious for that. After my first try with BestBuy talking on the phone (about a week ago) they said it would void my warranty and transfered me to Geek Squad in a split second. I was told by Geek Squad it would cost about $40 for them to install the RAM and, although they don't like to, they will install the RAM i purchased form Crucial. Now, for a computer geek who has installed RAM literally hundreds of times on desktops, this was not good news. While I have never actually installed RAM in a laptop before, I have taken apart one for work a long time ago. In my frustration I called BestBuy again (today) and this time was more careful how I clicked the buttons was put through with someone to ask my question. It was roughly, "If I upgrade my RAM in a desktop or laptop will it void my BestBuy extended warranty?" I was told that a supervisor needed to be consulted, and after about 5 or so minutes I was told that that would not affect the warranty in any way. This was a good thing! Suddenly I had motivation to upgrade my RAM. 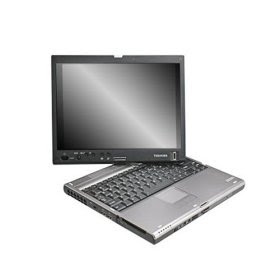 After I re-found a guide to take apart a Toshiba M400 I started my work. The M400 and M405 are basically the same computer and the guide disassembled the tablet all the way down to the mother board, and I only needed to access under the keyboard (where the RAM door is located). Sadly, I did not document my upgrade with pictures. Maybe when I am more accustomed to blogging I will actually remember. After the upgrade I reassembled everything in just a few minutes and booted back up. The Toshiba BIOS are a little crazy and it didn't even ask me to confirm the change in hardware before I saw a wonderful sight: the plain black Vista loading screen! After I booted back up I let the computer run for a while to make sure it wouldn't crash and then decided to run the benchmarks built into Vista. Below you can see my old scores. My score is not that bad. I am not too happy about my gaming graphics score but it is a tablet, what should I expect. Now, below are the benchmark scores ran after the RAM upgrade. Now, only two of my scores actually changed (I was hoping for three of them to improve). First, as expected, my RAM score jumped from a 4.5 to a 4.7 (the same as my CPU score). This is attributed to, not the increase in the amount of RAM, rather, the clock speed of my new RAM is higher than the RAM that shipped with my tablet. The other area of improvement was my graphics score. It jumped from a 3.1 to a 3.3! (This score is the Windows Aero score. Even with a 3.1 Aero was giving me no problems.) Again, since the RAM has a higher clock speed and it is used as shared RAM for the graphics card, this makes sense. The additional RAM probably did make a difference here. I did not see an improvement in my gaming graphics score. Now, this is still logical because the benchmark is testing my actual GPU, but since I now have faster RAM (and double the amount) I expect to see an improvement in gaming as well. Even though the only game I play is Second Life. I might even be able to multitask while I game, although Second Life has always had a tendency to crash constantly on me (under XP and Vista). Some reactions to the additional RAM under Vista, it makes a huge difference! I went from having 70% of RAM used at boot to 35% of RAM used a boot. Additionally, I don't have as much hard drive access when the computer is "idle." Vista already has way more hard drive read writes than XP, and making the jump form 1GB to 2GB really helps cut down on that (just from my unscientific observations). I have been using ReadyBoost from the start, and it appears that it is not being used as much. I guess that can be attributed to the fact that Vista uses "free" RAM as a cache for the hard drive, thereby using all installed RAM, while other operating systems just leave it empty. I still want to get a larger SD card for ReadyBoost, I might just procrastinate though. I promised in my last post that this post would be about technology and I was having trouble picking a topic so I finally decided to blog about blogging. I am fairly new to blogging and really haven't found a niche yet. I really don't have any readership yet, the formatting on my blog has changed at least twice a day since its launch, and I haven't gained any pattern to my posts yet. So, I've decided to talk a little about my experience getting started in the world of blogging. First off, I knew I was going to use Google AdSense. I was surprised how easy it was to get going with the service. I think my experience was so simple partially because of the simple yet powerful tools that Blogger has built in. Personally I think the ads do not detract from the look and formatting because I was able to customize them to match the colors I have selected for the blog. The powerful tools that blogger offers allowed me to use a drag and drop interface to make a personalized looking blog while using standard tools. The next thing that I knew I wanted to include in my blog was some way to track how many people are actually visiting my blog. At first I looked at using StatCounter to track the visits before continued my research. It was not that StatCounter did not appear to be a good service, it was simply that I found a better alternative. Eventually I found Google Analytics and thought it would be a good choice for my little blog. The features are full featured enough for a large website. Actually, many of the features are simply useless because I do not have enough hits. Many of the breakdowns are so detailed even with a reasonable number of hits for a brand new blog, the breakdowns are simply useless. I'm not going to post an example, but I have a feeling I will spend too much time analyzing statistics from the service. Lastly, I wanted to help promote my blog. Obviously there are a multitude of ways of promoting a blog but I quickly turned to Technorati. I subscribed to the service and quickly noticed how low my rank was. 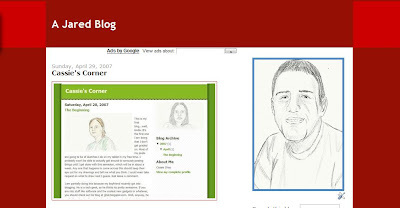 It has since moved up in the world since Cassie's Corner has linked to my blog. Technorati also provides other useful features such as the search box for my blog which is located in the right navigation bar. There are also some other features such as the Technorati rank which can be found somewhere on my blog. I have a tendency to move it around because I haven't found a place where I think it looks good. It has been floating around the bottom of the page. I have a good question that I have yet to answer: Why did I start blogging? Well, I have an admission. I actually posted a note about my upgrading from Windows Vista on my Facebook Notes. 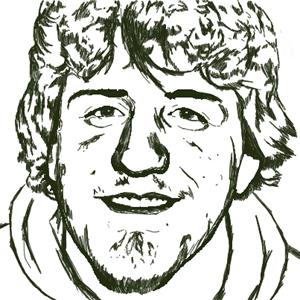 I spent probably an hour formatting it and working on it making it look really great. Afterward, I had this little voice in my head saying that I should start blogging. Well, I ended up listening to that voice and a few days later I subscribed to blogger. Actually, I still import my blog entries into Facebook using their built in import feature. I have considered turning it off but for the mean time I will leave it on. I still have some things that I want to add to my blog and change that I have yet to figure out. First off, I am not a big fan of Blogger's built in list of tags. Technorati has a tag cloud feature that I have considered using but in the mean time I will just keep things the way they are. The other thing that I am not a big fan of is the way the archive currently looks. I have it set to the the drop down setting which I think is too big. I do like the way that it looks when it is a flat list. I might add a recent posts drop down and change the archive to the flat list. I have a feeling that I am going to work on that as soon as I click the publish button. Which will be right about now. I've been having fun playing with the colors of my blog for the past few hours. I've settled on shades of red (obviously) but I am not quite sure if I like the current setup. I do like how it has the checkerboard type style in the upper corners but as for the main body of the blog, i think there is a bit too much red. I have links set to red and my Google Ads are currently red. I think the two prior need to be a different color to help set them apart form everything else. The obvious choice would be blue but I am not sure if I want them to be the default color. I should probably update my default picture to the left as well. It has the blue border built in since I started with a default template and the color scheme was all blue. That might happen later today. 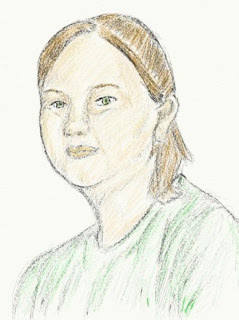 I was also promised a new profile picture within a week or two by Cassie, who also drew my current profile picture. Hopefully that will come through. I'll probably post again about tech stuff in my next post. Now that I have written it down hopefully it comes true. 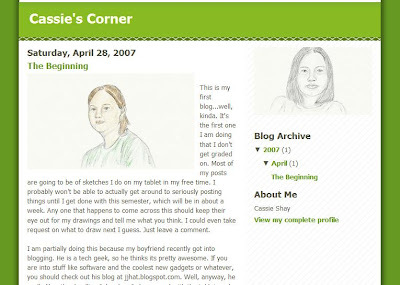 I have great news: Cassie's Corner was started yesterday! Cassie started her blog. She is still working on it but it is definitely under way. Her blog will definitely not be as dry as mine considering the main thing she will be posting is pictures she has drawn on her tablet (not technology like me). Hopefully she works on the layout (which already looks great) and some of the features over the next few days. I know I will be frequenting it to see what she has posted. I also know I will be bugging her to post more often (but I can live with that). Hopefully she is not too upset I forced her to get a blog and. If I already haven't said it enough, Thanks Cassie! You are totally awesome! So I just subscribed to Technorati and have submitted my blog. I guess I am really serious about this blogging thing. Hopefully it does not consume too much of my life. You can use the link below to look at my profile. It is the end of the semester and my last exam will bee next Tuesday but I am moving home later today. I will just drive back for my last exam because it is in the middle of the day. 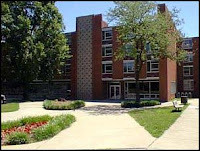 I've been in my dorm now for two semesters and have another two semesters to go before I finally get to co-op. I have summer semester in just a few weeks so after I get everything moved out, I just move it right back in. I could have payed to keep my stuff here but I'll be more likely to clean if I am forced to. I'll probably bring back less junk as well. I have to get back to packing now, I still have a lot of work to do before I am ready to load up the van with all of the junk I have accumulated over the course of this school year. Back in September 2006, when I was entering college I was faced with a problem: what to do when my hard drive fails. It is not a question of if rather a question of when. Having had hard drives fail before, I knew it was going to be very risky having all of my class notes stored on my hard disk. One of my concerns was having an recent backup of all of my files, but from experience I know it is difficult to force yourself to actually burn a CD or DVD of your files and it is just expensive and annoying to copy things to an external hard drive. If you use a hard disk you have multiple versions of files everywhere and CDs and DVDs just start to stack up and it is impossible to organize them. 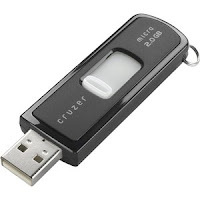 Even with these backups, it is possible for them to be damaged or lost. In some cases, you risk them being stolen. My solution, subscribe to an online backup service. My first problem, how much can I back up? Well, I am a data pack rat. I have all of my files neatly organized based on year and subject. My school files are organized in a detailed system with the first folder being each semester and the next folder being each class followed by class specific folders. I don't know what I would do if my files were somehow lost. When I migrated to Vista I transfered 20 GB of just documents, music, and pictures! This is not even all of my data, much remains on my older desktop waiting to be sorted through. Getting back to online backup services, the problem is many of them limit the amount of data you can backup. I wanted one that was not expensive (I am a college student) and would have a copy of my data in some server in the sky that would be safe even if my laptop battery decided to burst into flames. My software of choice ended up being Carbonite. (No, this has nothing to do with Star Wars.) Carbonite was a rather affordable service costing about $50 for a one year or $90 for two years. I decided to spring for a two year plan on my tablet (at the time I knew it was a bit of a gamble but the service seemed rather reputable). There were several things that made Carbonite stand out over other services. Definitely the most important feature was the UNLIMITED backup. Well, if you really look closely at the fine print it is not unlimited. Basically, they let you back up everything up to 50 GB then they restrict you to .5 GB a day backup. I really haven't noticed them enforce this .5 GB limit per day but I am sure it would take forever to backup a terabyte hard drive using a normal internet connection anyway. As you can see from my screenshot of the interface, I have over 55GB backed up on their servers. On my other computer which runs Carbonite I have even more data backed up (mostly family photographs). However, the above picture is probably misleading. A lot of my data appears to not be backed up. This is because I just transfered to Vista and manually transfered all of my files and reinstalled Carbonite. 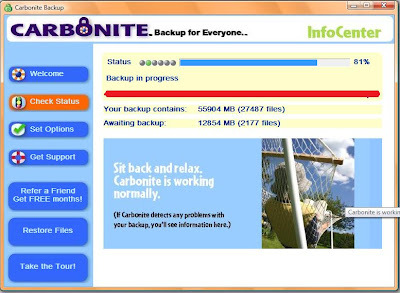 Another benefit to Carbonite is that it keeps the files you delete for a month. This way if you delete something you can always go back to your Carbonite directory and recover it. Also, Carbonite is also smart enough to not transmit a file it has already backed up. That is what it is doing right now file by file. It is like, is this file backed up, yes, OK, next next file backed up... It is taking a while. Overall, I am very satisfied with the service. Mozzy is one of the competitors software which offers a very similar service, but currently has more features. Carbonite hints of updates on their website but I have yet to see any of them make it to the end user. However, back when Vista was first released Carbonite was not compatible at all, and actually was one of the pieces of software that held be back from upgrading (obviously it is working now). Just to end with a free advertisement for Carbonite, I have had very little trouble with the service, it is very transparent. Their servers do go down from time to time (I assume for upgrades or maintenance) but typically my data is backed up and secure just a few minutes after I make the file. I have a feeling of comfort knowing that WHEN my hard drive finally gives out I will have one less thing to worry about. I have a feeling that a big project for class will be located on my drive when it crashes and I would be completely lost without Carbonite. Sometime around 6PM yesterday the internet went out here at UofL. I really needed to be studying for my EAC final, but I really wanted to get on the internet. I am simply lost without it. After confirming it was, in fact, not working with some of my dormmates, I called the IT help desk. They said they were having problems with the connection and it should be back up later. I then just happen to look at Skype and noticed Nick’s status message, “Argh, Skype and the university pages are the only things that work online.” I was actually having more trouble than other getting on the internet because I was using an external DNS server, Open DNS. After switching to the default DNS server Skype was able to "connect" and I started talking about the crazy situation using Skype. Yes, Skype was working! At first, I thought the DNS server was down, but after some investigation it appeared that the local DNS server was working properly and most things were still cached locally. I also double checked to make sure it was not the DNS server by pinging an IP address that I know works (my home) that was not on the network. Getting back to the main point of this article, the magical properties of Skype, I was able to IM Cassie who is definitely NOT on the UofL network. I was also able to confirm the fact it works using another one of my accounts. Additionally, Nick confirmed that the Skype Call Test was working. However, we both were not able to complete a call to a land line or cell phone. I was able to complete a file transfer between my computer and and Cassie's computer. So, to put it simply, I was somehow connected to the Skype network without having an actual internet connection. Obviously, Skype is P2P and the best answer that I have found is that someone on the GIANT UofL network was connected to the network, running Skype, and connected to an external internet connection. I am note sure how exactly I was on Skype without being on the internet.Now, skeptics might be saying, “the internet must really have not been down.” Well, updates were available through the help line in the form of a recorded message. The first update indicated that the fiber optic line that connected the network was severed. First estimates put uptime to be around 11PM and the next update pushed it back to 12PM at the earliest. Sometime in the middle of the night the internet came back up and everything is working. I am still not exactly sure how Skype managed to stay online during the outage. I did learn that it was not possible to log into Skype if you were not connected before the outage. I was lucky, I was already logged in partially (but not connected) before the outage. I am glad I am back online, especially since I only have one final left and it is next week. I love it when my favorite things come together into one place. In this case it was Ask A Ninja and Mythbusters. Last night a new episode about ninja myths aired it was one of their better episodes. The myths they were busting were actually interesting and it was a rather comical episode. Go figure that Grant was the most ninja like of the entire team! It's "East Meets West" in this episode of MythBusters. Shrouded in secrecy and mythology, not to mention cult popularity, ninjas are perfect fodder for the MythBusters. The whole team joins forces to pit science against martial arts mystique. Can ninjas run on water as movies like Crouching Tiger, Hidden Dragon would have us believe? In "Walking on Water," Adam, Jamie and a ninjitsu master try their luck at aquatic agility. And if that doesn't work, the boys get confrontational as they compete to see how ninjas — masters of illusion — could create the impression of water running. In "Samurai Swing," Kari, Tory and Grant find out if a ninja could stop a samurai sword with his bare hands. To avoid the sharp sting of steel the team devises a ninja rig to clap onto the sword, and it seems like this myth is all in the timing. After the show they said their would be a special on their website and below is the YouTube copy of it. That will probably be taken down so Mytbusters.com has a their official copy as well. UPDATE: Go figure, the YouTube video was taken down. Just click HERE to see the clips. There are two and each are about three minutes long. I was never a fan of the U3 Launch Pad even when I used XP. All it resulted in was asking me to launch Skype a second time when I put it into my computer. It also would take over a minute to recognize in a new computer. All I really use it for, since I always have my tablet with me, is transferring files to and from other computer. I never really used the feature, to be honest I rarely even used the drive. Fast forward to now when I am running Vista, the U3 software no longer launches! Good news, right? Well, not exactly... It is good in the fact that it is not there, except when I put it into an XP or Windows 2000 computer. I even tried reformatting the drive. The software was actually gone, until it was put into Steven's computer to test it out. Just like a terminator, it slowly reformed until, yes, the U3 Launch Pad was once again. "Wait! You're about to throw out the part that makes your drive smart." After clicking the link at the bottom, it asked for some information (that I did not provide) and allowed me to download the removal utility. What took me by surprise was that the utility actually functioned under Vista and successfully removed the software from the drive, forever! I am now happily testing out the drive using ReadyBoost instead of using my 1GB SD card. I really can't tell a difference yet but the fact it should be faster and is double the size should help, at least a little. 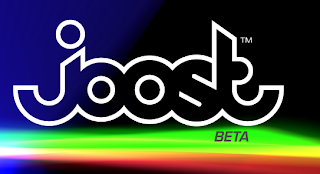 A while back, March 1 to be exact, I received my long awaited invite to the beta test for Joost. I promptly installed it and played with the amazing interface. I then proceeded to realize that there were absolutely no shows that I wanted to watch on the service. I still think I have not watched an entire show all the way though on the service. It is not that the quality is not up to par, it is actually very "average" for this type of service. To be quite honest it puts most flash based video playback to shame. It is not even that the video playback is on my computer. I am quite accustomed to watching video on my laptop because many of my favorite shows are podcasts. The problem is what shows are on there. Now, Viacom has partnered with Joost to deliver shows including some content off of MTV and Comedy Central. As more content provides join in and shows I actually want to watch start appearing, I have a feeling I will be launching this application more and more often. I really hope other major content providers start using Joost to distribute their shows. It is a fairly secure platform so it would be hard to pirate the shows. The ads are very non intrusive unlike some other services. I can't wait to see what else is to come. I can only imagine what it would be like if Heroes or Mythbusters was available on demand through Joost. Last Saturday night I upgraded my Tablet to Windows Vista. As a result I have been having to spend every waking moment fighting with compatibility problems. Most of the serious problems are driver related (my printer, scanner, and camera. The camera now works) but one software error has arisen. Getting to the point of this post, iTunes crashes when I try to play video podcasts! This is very upsetting because about half of the content I watch comes from a podcast. The following is a list of podcasts that I actually watch regularly. (I'll leave off the audio ones because they have been working). I have been without my shows for almost... well, just a few days now. It's not to say that I don't have other ways of watching my shows, it is just that iTunes was always my favorite. I did try using Democracy for a while but it crashed (under XP) and was not able to really play audio podcasts along side me videos. It is not that I do not have other ways to get my podcasts, every website host them so you can view each episode in the browser. Also, I could just open the files that iTunes downloaded with another program such as VNC. However, its still not the super easy way they iTunes provided when I was under XP. To be quite honest I am not even sure if it will crash if I try to play one again. The last two times it bluescreened and was rebooting within a few seconds (but the boot process took the normal two minutes). I might try again, but when I do I'll just be expecting another bluescreen. Hopefully Apple releases a new version soon, although the current version claimed to be compatible with Vista. In the mean time, I will probably just watch my shows in a browser. It won't kill me but I sure do miss the higher quality video iTunes provided. I don't know why, I really don't have much time considering how crazy Speed School is but I needed a new hobby. I'll probably be posting a lot about technology considering that is about 50% of my life. :D However, I'll try to post things other than that so it is not totally tech. I don't know how often I will be posting and I am not even sure how this is going to work out.